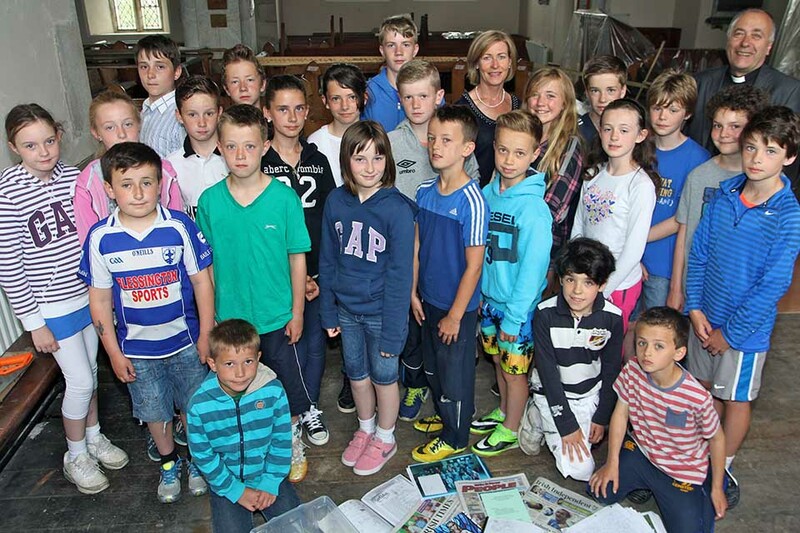 Pupils of Blessington No 1 School felt the hand of history on their shoulders this week when they buried a time capsule in their parish church. The floor of St Mary’s Church in Blessington is being currently being replaced and the children of the school and the Sunday School put items representing life in 2014 in the time capsule which will be encased under the floor. They hope that it will be dug up in two hundred years’ time. The project was the idea of Blessington’s Rector, the Revd Leonard Ruddock and the pupils responded to his request for items with great enthusiasm. Among the objects they chose to include were a shoe, an iPhone, a water bottle, a chocolate wrapper, examples of toys including loom bands and K’nex and coins. They also included laminated explanations of words in common use today including ‘selfie’ and a picture of a Bugatti Veyron. Also placed in the box were today’s national and local newspapers, a Dublin and Glendalough Diocesan Directory and the book of reports from Diocesan Synods to enable the people of the future have a window into current affairs and the life of the Church of Ireland. All the pupils of Blessington No 1 School wrote about their lives and some composed messages to the people of the future and drew pictures to be included. Class photographs of the pupils are also in the box. The Sunday School children have each created images of their handprints and their capsule includes information about the children and the teachers as well as a parish newsletter and a copy of the Dublin and Glendalough magazine, The Church Review. “There is a strong connection between the church and the school and now that link will be firmly cemented under the floor of the church,” Mr Ruddock explains. He plans to put a plaque on the pew over the burial site indicating that a time capsule is buried beneath. The replacement of the old floor is part of the parish’s ongoing plan of refurbishment of the church which was built in 1683. They suspect that the floor currently being dug up is the original one but it had become rotten. The church is closed for worship while the work is underway with alternative Sunday services taking place during June and July at St John’s, Ballymore Eustace, at 10.30am and St John’s, Cloughleagh, at 11.45am. Building work is also being carried out at the nearby Roman Catholic Church of Our Lady (although it is not closed for worship). “Both churches in Blessington are like building sites at the moment and I see the work at each as an act of faith in ourselves, the future and God,” the Rector comments.